Complimentary Shipping on CMI Headers! Teague Custom Marine is kicking off the boating season with complementary shipping* on performance marine exhaust systems from (CMI) Custom Marine Inc. During the month of April, Teague Custom Marine customers can enjoy complementary shipping when they purchase complete, stocking sets of CMI Exhaust Headers – offer is valid for orders that are received during the period of April 1-30, 2019. 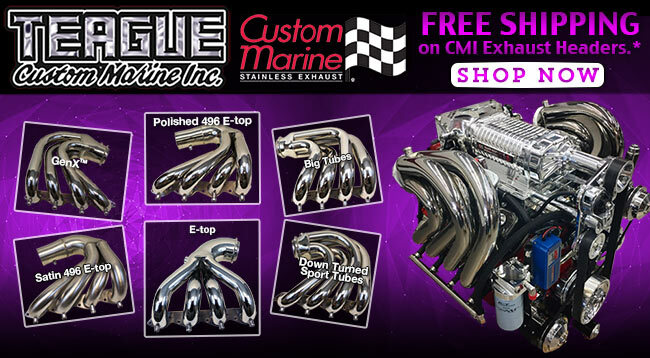 No offer code is needed, simply shop the selection of CMI headers in our online store and we will offer you FREE shipping* on qualifying purchases for this limited time. Call us to Order at 661-295-7000 or visit our website today. Teague Custom Marine is the leading stocking distributor for CMI Exhaust Headers, Parts, & Accessories and can also offer technical assistance and advice for your particular application. Teague Custom Marine executes custom tailpipe builds in-house to match customer-provided specifications, even without the boat present. Boat builders and OEM accounts nationwide count on Teague Custom Marine for their tailpipe and other fabrication needs, and this same expertise and level of service is also available for retail customers. From template or drawing to reality, Teague Custom Marine’s fabricators can create a custom part. If the exact part does not already exist in the company’s extensive performance parts catalog, a custom piece to fit a particular project or provide a solution in a particular application can be created. If Teague doesn’t have your part on the shelf, they can make it. If it cannot be made, Teague Custom Marine will help you find the best solution for your installation. Teague Custom Marine is your #1 source for all performance marine engines, parts & accessories, being the largest marine distributor, also offering worldwide shipping. Contact us at (661) 295-7000 to make a parts inquiry, schedule a service appointment or request a quote for service. Teague Custom Marine is headquartered in a 30,000 sq.ft. mega-store and shop in Valencia, CA. Keep in touch! Click here to sign up for our mailing list and receive exclusive special offers from Teague Custom Marine, like our page on Facebook and follow us on Instagram to keep up with the latest from Team Teague. *Subject to availability, while supplies last, offer is valid April 1-30, 2019, act now! This promotion applies only to stocking CMI header sets only (in stock and shipping from TCM facility and matching port & star. set) and only applies to Standard UPS Ground service within the U.S. Not valid for International or expedited shipping options. Call to redeem offer or make a comment at checkout on online orders and final order price will be adjusted. Discount is applied at the sole discretion of TCM; all rights reserved. This entry was posted in Teague Blog and tagged (CMI) Custom Marine Inc., CMI headers, FREE Shipping by Teague Custom Marine. Bookmark the permalink.